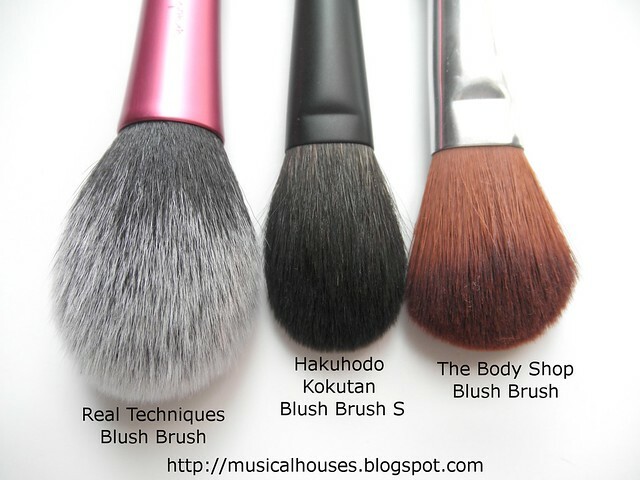 So, after I bought my Hakuhodo Kokutan Blush Brush S from Beauty Asia 2014, I thought some of you might appreciate a comparison between the Hakuhodo Blush Brush S with some other similarly-sized and shaped brushes in my stash, so I brought them out for you! In my stash, the closest brushes are The Body Shop's Blusher Brush, as well as Real Technique Your Finish Perfected Blush Brush. Here they all are together. While there are some similarities at first sight, they aren't all identical. The blush brushes all differ in in shape, bristle type, and bristle arrangement. And I use each of these brushes in slightly different ways. 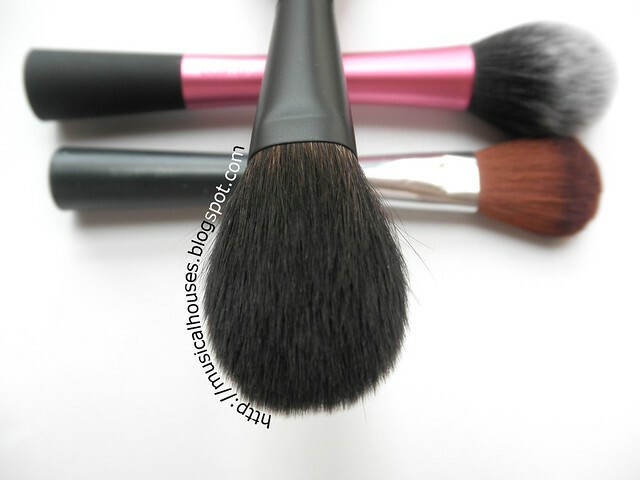 So, if you want to see a side-by-side comparison, as well as hear my thoughts on each blush brush, well, here you go! 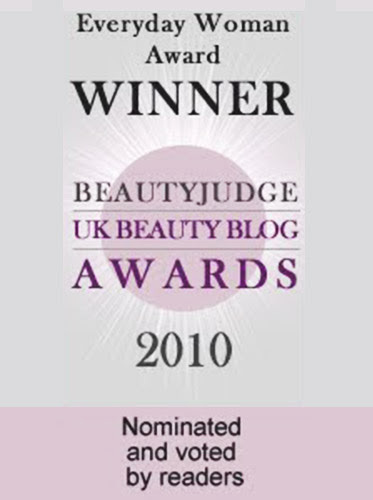 The Body Shop's Blusher Brush: A typical blush brush with soft, synthetic bristles. The Bottom Line: A great all-purpose blush brush, with the ability to handle different types of powder blushes. 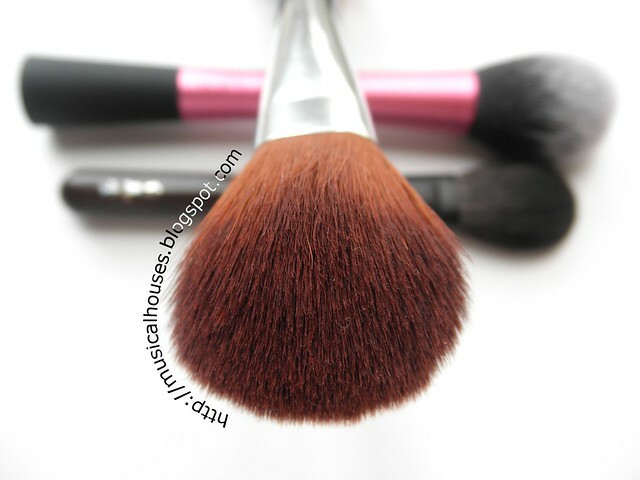 The Real Techniques Your Finish Perfected Blush Brush also has synthetic bristles, but the bristles are much more sparsely arranged, and it is not as dense as The Body Shop's. Otherwise, it also has the same soft feel as The Body Shop, and is also arranged in dome-like fashion, although the shape is not as flat as The Body Shop's. Because it has such sparsely arranged bristles, I find it best for very pigmented blushes, as it's really great at depositing a sheer wash of colour. Also, it's pretty large for a blush brush - I imagine that some people might prefer using this for contouring or similar functions. And, it's actually very value-for-money - this is the cheapest of all the blush brushes, but it is not at all the shabbiest! Definitely a great buy if you are on a budget (in fact, I'm a little surprised it's not more expensive - I think the Pixiwoos could have doubled the price of their brushes and it would still sell). The Bottom Line: This budget-friendly rounded dome and sparse bristles make this great for applying a light wash of blush, bronzer, or contour powder. The last brush, the Hakuhodo Kokutan Blush Brush S, is a mix of blue squirrel hair, as well as synthetic bristles. 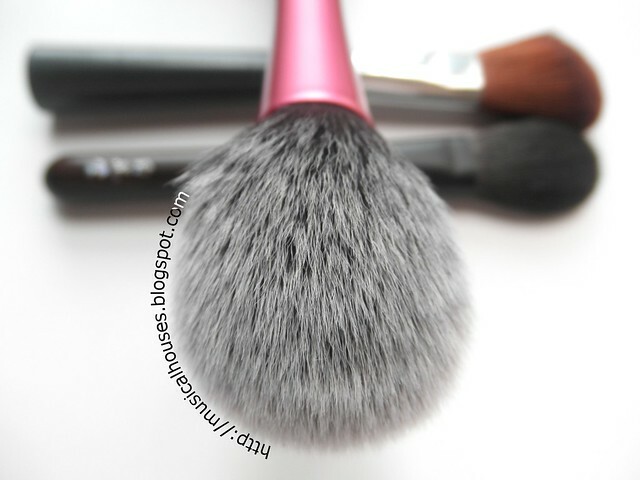 This makes this by far the softest of the three brushes, and indeed, the softest of all the brushes I have, which are either synthetic, or some form of goat hair or synthetic hair (for the face brushes) or horse hair (for the eyeshadow brushes). In fact, I don't think I've ever seen any hair as soft as this mix of blue squirrel and synthetic bristles. Despite its softness, it actually packs on a fair amount of pigment, because of the natural hair fibers. 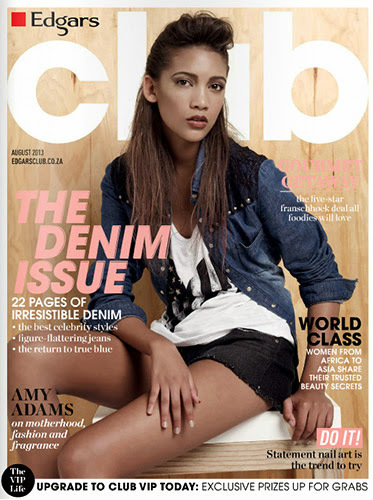 For some reason, it seems to me that natural hair bristles deposit more colour on the skin than synthetic hairs. The hairs of the Kokutan Blush Brush S, however, are fairly sparsely arranged (especially if you compare to some of Hakuhodo's other blush brushes, which can be very dense), so this doesn't pack on too much pigment with one swipe. I generally use this for light-to-medium pigmented blushes. Anything too pigmented might run the risk of over-application. Good thing is that the bristles are still soft and floppy enough to allow for good blending, if you do accidentally apply too much! The Bottom Line: Possibly the softest blush brush I've ever come across, this ultra-luxe brush is great for light-to-medium blushes, and for blending out colour. So that's my round up of all the blush brushes I have that are similar to the Hakuhodo Kokutan Blush Brush S I purchased during Beauty Asia 2014. I hope this helps some of you who are wondering 1) why I have so many blush brushes, and 2) which of these would be best for them. It all depends on what type of blushes you use (super pigmented? Mainly not that pigmented?) and what kind of application you desire (do you like to blend? Do you want a fine wash of colour? ), and your budget (obviously the Hakuhodo is pitched at a more spendy audience, but fortunately great alternatives are available). I own all three and think they're different enough to keep them all, but if not, at least now you know which is best for you! Thank you so much for this comparison post! I have the RT blush brush and I am really loving it. I would love to see a post where you compare some different crease brushes. 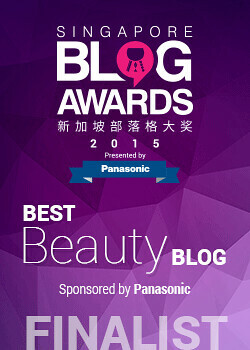 I am always on the look for the next best brush to review on my blog or just to collect. 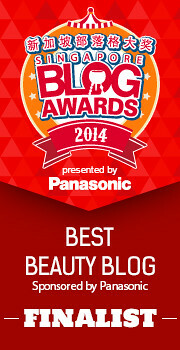 I am a a beauty junkie!!...LOL! @Beth Graves: Thamk you for your comment, you're right, a comparison post on crease brushes would be a great idea! Most of the eye looks you see use the Essence of Beauty Crease Brush Duo, which I've blogged about here: http://musicalhouses.blogspot.com/2012/06/old-vs-new-essence-of-beauty-crease.html and here: http://musicalhouses.blogspot.com/2011/02/essence-of-beauty-crease-brush-duo-bff.html but I also really like the Stila #7 crease brush, which is bigger and fluffier than the Essence one. I've mentioned that brush in passing but have never blogged about it. I will see if I can compare those two as well as others (like my elf brushes) for you! It might take a few weeks (I have a backlog of posts) but ill be glad to see what I can do!